Chen Kaige is one of China's most famous contemporary film directors. His films, from Yellow Earth (1984) and Life on a String (1991) to Farewell My Concubine (1993) and The Emperor and the Assassin (1999), are known for their visual flair and epic storytelling. His style is sober and realistic, which blesses his films with a beautiful sense of humanity that reaches across all political and cultural boundaries. Chen's most recent film, Caught in the Web, arrived in China's cinemas in early July. What is unusual about this film is that it explores the infamous "human flesh search" phenomenon in China -- the conduct of massive researching using Internet media such as blogs and forums to expose individuals to public humiliation. The term "human flesh" refers to "the use of knowledge contributed by human beings through social networking, as well as the fact that the searches are usually dedicated to finding the identity of a human being who has committed some sort of offense or social breach". Once such identity is exposed, it can then be rapidly distributed to hundreds of websites to entice public sentiments against the perceived moral transgressor. The wrongdoer in Caught in the Web is Ye, who has just received the news that she only has two months to live as a result of her leukemia. Heartbroken and unsure what to do, she boards a bus and neglects to offer her seat to an elderly man -- an act that is considered immoral in Chinese society. Worse, when the old man angrily accuses her of being rude, she replies, "Sit on my lap if you want to!" The whole episode is secretly captured on mobile phone by a trainee reporter and passed on to the ambitious journalist Chen. Having quickly realized its newsworthiness, Chen decides to broadcast the footage on television, urging the general public to conduct a "human flesh search" on the female sinner. Tens of thousands of audience members voluntarily participate in the search and, within hours, Ye's identity is discovered and distributed throughout the Web, including her name, address, fixed and mobile phone numbers, and employment details. Ye soon begins to receive thousands of harassing phone calls and hate mails. Worse, while Ye is being hunted by the crowds, the wife of her boss decides to contact the media and accuse Ye of seducing the rich and successful businessman. Journalist Chen then leads the media to start another campaign and expose Ye's whole life story, portraying her as an immoral "marriage breaker" and causing her to be physically assaulted by an angry mob. While Caught in the Web attracts widespread attention both within and outside of China, it is worth pointing out that the film is based on a Chinese "online novel" titled Wangshi, which can be translated word-for-word as "Web Death". As an article by Time magazine reveals, online novels in China are extremely popular and ridiculously cheap. Shanda Literature, which controls over 90% of China's online-reading market, boasts a readership of 25 million and is growing at 10 million per year. The company makes more than $15 million per year, with each reader being able to access up to 75% of a book for free. The reader then pays less than a cent per 1,000 words for the rest of the book. "In other words, it costs about one-tenth of the paperback price to read a book online," the article notes. Wenyu, the author of Wangshi, said in an interview about the online novel that the more often one speaks out on the Web, the more likely one will be searched and exposed. "The more 'speaking power' one has on the Web, the more responsibilities one should take on, and the more cautious one needs to be when one makes comments online. While netizens can be described as lost birds often flying in wrong directions, to some degree, the act of irresponsible commenting on the Web can be referred to as a kind of Internet violence." 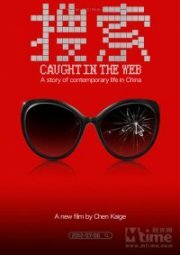 Producers of Caught in the Web have also revealed that this film is a call for attention to the present chaos on the (Chinese) Web. Like the online novel, the film critiques social reality and provokes thoughts on human relationships both online and in reality. It gives a diagnosis on China's social diseases throughout the past thirty years. It is also worth noting that Wangshi was the only online novel among the 130 works longlisted by the China's most prestigious Lu Xun Literature Prize in 2010. While it did not win any award, this has prompted Chinese media to consider the increasingly important role of online novels as part of China's mainstream literature. Interestingly, some people have questioned why Wangshi is the only one among China's numerous online novels that has ever been shortlisted for Lu Xun Literature Prize. Surely there are better online novels in that country? The answer is that the Prize sets a limit on the length of medium-size novels as being 25,000-130,000 words, but the majority of China's online novels contain more than 600,000 words and are therefore ineligible for selection. Imagine that, a 600,000-word novel! Now there is a challenge!